In our pursuit to continually improve the user experience and efficiency of DivvyHQ, we'd like to introduce a new feature that we call the "Content Item Slide-in" (CI slide-in). The CI slide-in provides users with quick access to a content item's pertinent details, the ability to edit those details, as well as interact with associated comments, attachments and tasks. By single clicking on any content item on the Dashboard or Calendar Interface (soon to be available on other interfaces) you'll notice that a hidden right column expands, allowing you to preview the selected item's pertinent details. These details can be edited by clicking the blue Edit Details button at the bottom, which switches the entire column to edit mode. You can also delete a content item within this overlay by clicking the trash can icon located in the upper right corner. To duplicate a content item within this overlay, click the duplicate icon (see image below) located in the upper right corner as well. 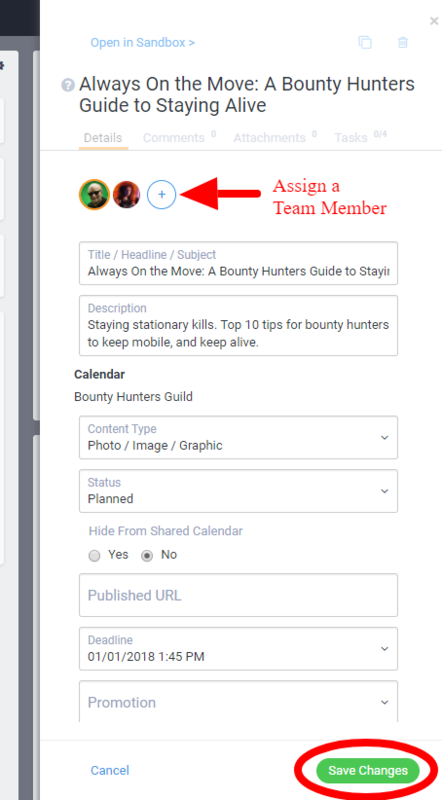 If you need to get the content item in front of a team member(s) quickly, click the send to option, and send a message and link of the content item for immediate review. By clicking the download option, you can download the content of the content tab to a .doxc or PDF. A user can transition to the content item's content editor screen from this overlay by clicking the blue Open in Sandbox link. 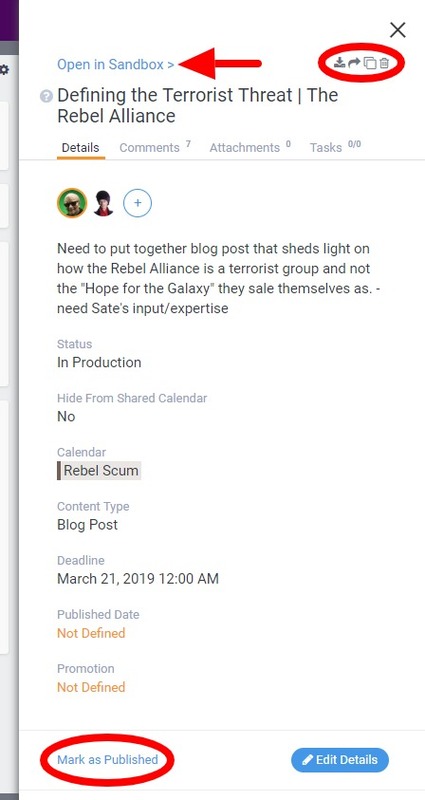 If the content item hasn't been marked as published yet, and it contains a deadline date, they can also mark it as published by clicking the blue Mark as Published text. The Details Tab provides the majority of a content item's pertinent information, and when the Edit Details button is clicked, it also allows users to make changes to most of these fields, including assigning team members! Once changes are made, press the green Save Changes button to save your edits. NOTE: The Published URL field is always visible in edit mode but only shows in read only mode when the content item is in published status. The Attachments Tab provides users the ability to add attachments and work with them, without having to open the item in the DivvyHQ Sandbox. You can add attachments via drag and drop, choosing a file, or attach via the cloud. 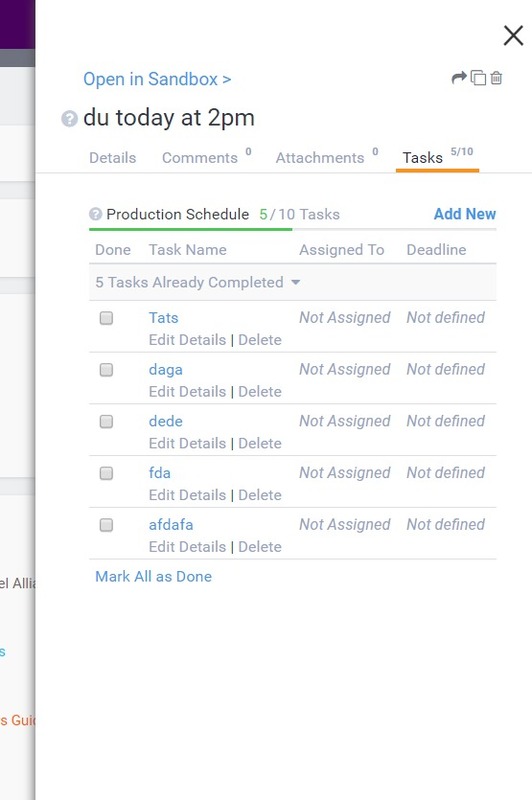 The Tasks Tab provides users a way to view details about task(s) associated to the content item without having to open the DivvyHQ Sandbox. The small number to the right of the Tasks Tab label indicates the current number of tasks that have been created for the content item. We hope you like this new addition to DivvyHQ! If you have any feedback or enhancements you'd like to see for the content item slide-in, please use the Feedback/Report a Bug button in the lower left of the DivvyHQ interface.